This CellML model cannot be opened in COR and it cannot be run in PCEnv due to the use of vectors - something which may be included in the CellML 1.2 specification. The way this model is written it is not ideally suited for expression in CellML. However, we have attempted to describe the model in CellML with the hope that in the future it may be further validated and curated. ABSTRACT: In this paper, concepts from network automata are adapted and extended to model complex biological systems. Specifically, systems of nephrons, the operational units of the kidney, are modelled and the dynamics of such systems are explored. Nephron behaviour can fluctuate widely and, under certain conditions, become chaotic. However, the behaviour of the whole kidney remains remarkably stable and blood solute levels are maintained under a wide range of conditions even when many nephrons are damaged or lost. A network model is used to investigate the stability of systems of nephrons and interactions between nephrons. More sophisticated dynamics are explored including the observed oscillations in single nephron filtration rates and the development of stable ionic and osmotic gradients in the inner medulla which contribute to the countercurrent exchange mechanism. We have used the model to explore the effects of changes in input parameters including hydrostatic and osmotic pressures and concentrations of ions, such as sodium and chloride. The intrinsic nephron control, tubuloglomerular feedback, is included and the effects of coupling between nephrons are explored in two-, eight- and 72-nephron models. 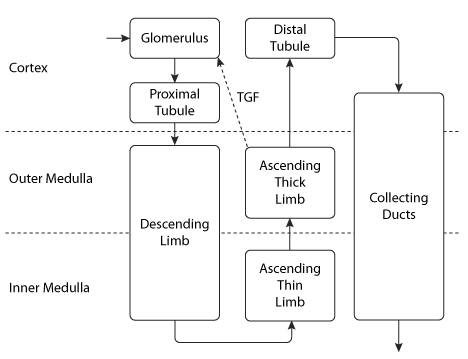 Schematic diagram representing the model for the single-nephron tubule as a network automata, showing the edges that capture fluid flow, solute transport and tubulo-glomerular feedback. Derived from workspace Moss, Kazmierczak, Kirley, Harris, 2009 at changeset 5c2c881f7263.